This post is sponsored by DMC. All opinions are 100% my own. Click here for more information. Thank you for supporting Whistle and Ivy! I hope those of you who celebrated this week had a lovely Canada Day and Fourth of July! My kids are so funny, they preferred running around with friends to sitting and watching the fireworks. I’m not sure either one really watched them. I guess everyday glow sticks are more fun than giant explosions of colored fire in the sky (go figure). Regardless, a good time was had by all. I spent some of my downtime this week working on this adorable Crochet Petal Princess Set. Aren’t the colors perfect? I think I am really crushing on Peach this summer. And of course gray. Always gray. 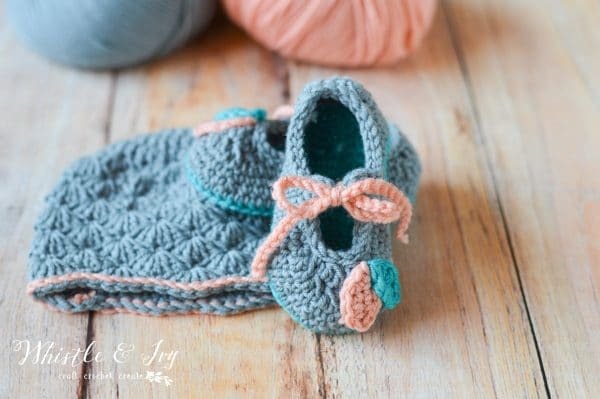 I used DMC Woolly for this cute booties and hat set. It’s super soft and squishy, perfect for baby things. It’s also a lighter weight yarn than I am used to using, and it was absolutely perfect for this project. Worsted will always be a favorite of mine, but this #3 weight really shows the pretty textures of the stitches, especially those gorgeous shells! 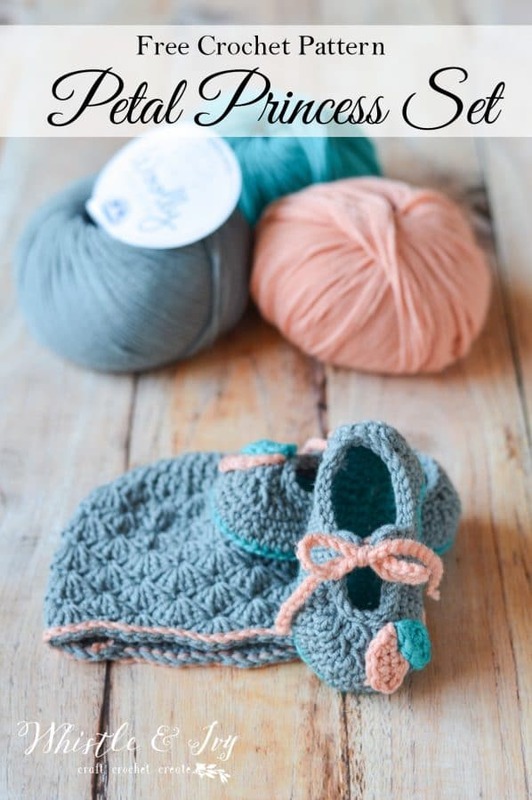 It works wonderfully for such a tiny project like baby booties and baby hats (and the tiny petals on the booties). DMC Woolly has a wide variety of colors as well. I admit, I took quite a while choosing colors for this project. That pretty peachy pink has my heart! 1. 4 sc in 2ch ch from hook. Sc 4. Hdc 2. Dc 4. 7 dc in last st.
10. Sl st around. (34 sts). Ch 62. Tie off. Pull loop through and pull tight. Clip ends. Ch 7. Sc in 2nd ch from hook. Sc in next st. Hdc 3. Sc in last ch. (working across opposite side of ch). Sc on opposite side, starting in the first ch. Hdc 3. Sc in last st. Join with sl st. Leave a long tail. Using your darning needle, sew the petals in place, one by one, onto the outside toe of each shoe. You can also weave in the ends and attach them hot hot glue. Be sure to put the glue very close to the sides, as they will curl up over time if not properly attached. Using your hook, pull the laces through the top of the small straps. Tie in a bow. 1. Dc 10 into ring. Join with sl st.
2. Ch 2. 2 dc in each st around. (20 sts) Join with sl st.
8. – 14. Alternate rows 6 and 7 (respectively) until you reach 14 total rows. 15. Join contrasting color. Loosely sl st in each st around. Enjoy this pattern! I truly enjoyed making it, and I hope you do too. 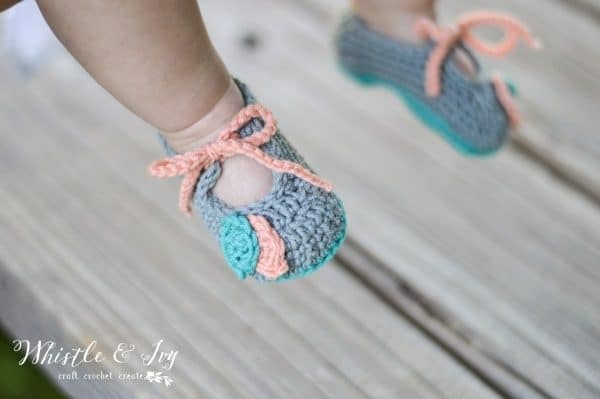 Be sure to stop by DMC on Facebook and thank them for sponsoring this free crochet pattern! Want more DMC ideas? 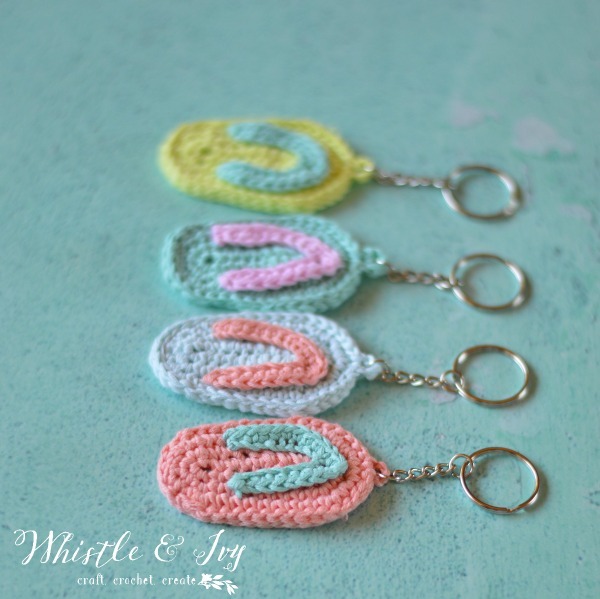 These Flip Flop Keychains are made with DMC Yummy. Those colors are absolutely delicious! Like this Crochet Petal Princess Set? Subscribe! Hola, me gustan muchos tus trabajos, pero veo que son todos tejidos con hilados gruesos, no tienes trabajos con hilados más finos, a mi gustos tienen otra presentación, los trabajos son más lentos en terminar pero la terminación….. vaya que si no vale la pena!!!!! Hello! I don’t have very a many things with very fine crochet yarn, I am sorry! Could you explain the changes needed to make these 0-3 mo size? I don’t have that size designed for this shoe,I am very sorry! I am making the booties but I’m stuck on #1. After it says, 7 dc in last st., the next line says (still number 1) – Dc 4. Hdc 2. Sc 4. Join with first sc. 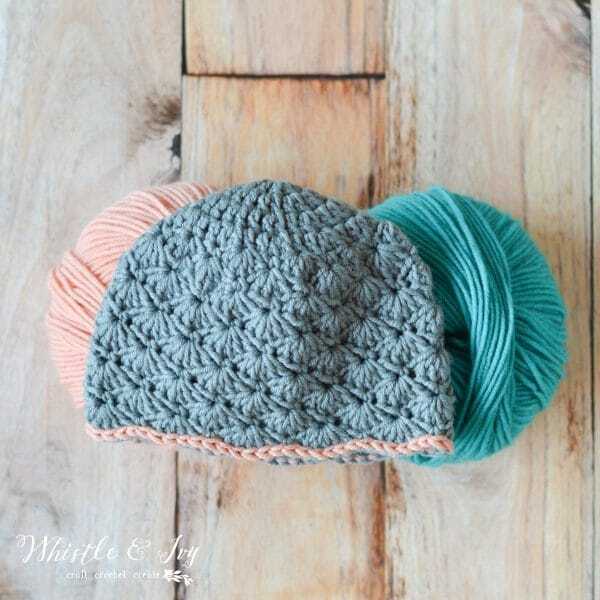 (31 sts) – but I don’t know where I start the Dc 4 since I just crocheted in my last stich. Should I chain or turn my work before step Dc 4 Hdc 2. Sc 4. Join with first sc. (31 sts)? Please let me know what I’m missing. Hello! The last dc 7 makes a semi circle so you can move around to the other side of the chain and work back across it. I am sorry I didn’t express that in the pattern, I will fix it. so pretty! I love how clear the shells are. Can’t wait to see what you make with that teal! Do we join each row in the top of the chain 2’s? Do we count the chain 2 as a stitch? I am trying to work on this hat now for a baby that is due any day, as a gift. Thankyou for the cute pattern and the help. The 2 ch does not count. Let me know if you need more help! Wow…these are really very cute. Thanks for sharing this post. Hello. I want to try making this hat. Very cute. After reading the pattern over I was wondering if you would reply and let me know if there is a mistake on Row 6.? It reads Ch 2. Ch 2 * sc in 3rd dc of next shell. Dc 5……… Should I Ch 2 one time only, when beginning this row? Was that a mistake by repeating or should it be Ch2. Dc 2? Please clarify as there is a baby due any day now and it is a lovely pattern. Thankyou MF. Oh dear! YES! That is a mistake, thank you for bringing it to my attention! So precious! That set would darling on any little princess. Had to pin it. These are so cute and I love the colors you chose! 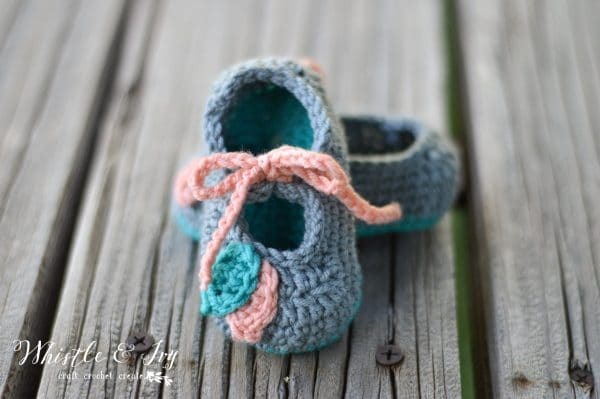 We’re expecting in October – this would be a great project for me to work on right now! Thank you so much Courtney! You have no idea how much your words mean to me :) Thank you for taking the time to leave a thoughtful, kind comment, and I am SO glad you are enjoying and using my patterns. That means the world! Thank you!